I found in Facebook a short notification about the Cryptic playing cards. I soon discovered the term “Cryptic” comes from the amazing cryptic camouflage found in moths. In 2016, 250 people were convinced by those curiously camouflaged cards that this project was successfully funded. The English artist Immy Smith is also a scientist with a PhD on bioscience (www.immysmith.com). Her works are inspired by biological patterns & specimens. 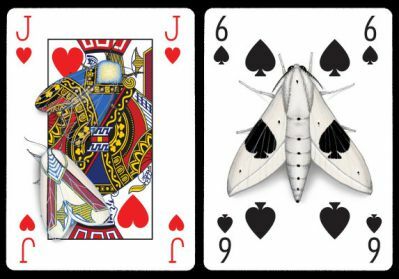 She started to paint moths camouflaged on printed pages, tickets and at last on standard poker playing cards. Of course, all cards are illustrated and there are four different jokers. To have a better look at the exquisite artworks, a A5 booklet has also been produced. This is a signed, numbered and limited edition of 250 with extra illustrations.